Identification: Japanese Barberry is a compact woody deciduous shrub with arching branches. It generally grows from 2-3' but can get as high as 6-8' in ideal conditions, forming thick impenetrable thickets. The leaves are small, oval, smooth and untoothed, from 1/2-1 1/2" long. Leaf colors include green, bluish-green to dark red and purple. The shrub blooms in the northeastern U.S. from early April through May with small, 1/4", pale to bright yellow flowers hanging in clustered umbels from the underside of each stem. These flowers form bright, 1/2" red berries that persist into late winter. In autumn the foliage varies in shades from yellow to crimson. The bark is brown with older stems deeply grooved, growing in a zig-zag form and covered with very sharp single spines growing from every node. The inner bark is yellow, as are the roots, and when scraped these parts have a pungent odor. The Japanese Barberry may sometimes be confused with the Common, or European Barberry (Berberis vulgaris) which used to be considered a pest in the 1930s as it colonized open farmland but since second generation forests have grown up in the northeast, Berberis vulgaris seems to have lost the competitive edge to Japanese Barberry and itself is no longer considered invasive. There is a native barberry, Berberis canadensis, which grows only in the southeastern U.S. and not in Canada or in New England, the areas where Japanese Barberry is currently becoming a very serious invasive pest. Whereas all three Berberis have spiny stems, red berries and yellow inner bark, B.vulgaris and B.canadensis have toothed leaves as opposed to the smooth leaves of B. thunbergii, and the spines of the B. thunbergii are usually single and unforked at each node whereas the spines of B. vulgaris tend to be double or tripled branched. Original Distribution: Discovered growing in the mountains of Japan by Russian botanist Carl Maximowicz in 1864 and named after Swedish botanist C.P.Thunberg (1743-1828). Current Distribution: Extends from Nova Scotia south to North Carolina and west as far as Montana. Has been reported as invasive in twenty U.S. States, straight down the eastern seaboard from Maine through North Carolina and west into Pennsylvania, Ohio, Indiana, Kentucky, Tennessee, Wisconsin and Missouri. B. thunbergii's progress in the United States has, to date, been held in check to the south by, probably, its need for cold winter temperatures for stratification of the seeds, and to the west by, probably, drought conditions. Although very drought tolerant once established, a very dry terrain would tend to discourage its incursion. Site and Date of Introduction: In 1875 seeds imported from Russia were planted at the Arnold Arboretum in Boston, Massachusetts. Shrubs grown from these same seeds were planted in 1896 in the New York Botanic Garden. The exotic shrub was apparently regarded as an interesting specimen plant and there are no records of the species having naturalized in the U.S. until after 1910, when it began colonizing roadside verges and open pastures. Mode(s) of Introduction: By 1920 Japanese Barberry was being promoted by U.S. nurseries as an attractive landscaping alternative to the European (also known as "Common") Barberry, B. vulgaris, which had been brought over by early European settlers to use as hedgerows and for dyes, jams and medicinal purposes. European Barberry had itself had become naturalized and, because it was an alternate host to Black Rust Stem, (Puccinia graminis) a serious fungus that attacks all cereal crops, the shrub was actively eradicated by the USDA from farmland in the 1910s. Because of B. thunbergii's s attractive fall foliage in a variety of cultivars (there are currently 17 extant cultivars) and the fact it was widely believed to be unsusceptible to Puccinia graminis, the Japanese Barberry became very popular as an ornamental shrub, often planted by a doorway or alongside the house. It began spreading from cultivation in suburban and rural retreats and by the 1960s had dispersed widely and exponentially. By the 1970s it began to be regarded as a problematic invasive in the United States. The sale of Japanese Barberry was banned throughout Canada in 1966 but in the U.S. it is still widely propagated and sold as a problem-free, easy-to-grow shrub. Reason(s) Why it has Become Established: Berberis thunbergii has become naturalized, to the point of running rampant, in North America for many of the same reasons that this shrub is still a popular nursery plant. "Rugged, adaptable, no serious problems or pests, easy to maintain, transplants readily, shade and drought tolerant, deer resistant" is typical ad copy found at any site offering this shrub of "colorful fall foliage." Although it prefers well-drained sites it does just as well in wetlands. It is now found in black ash swamps, wetlands, open woodlands, pastures, meadows and disturbed areas. The shrub also has a disturbing tendency to do quite well in the dense shade of forest canopies, such as oak canopies in Wisconsin, and mixed deciduous canopies of New Jersey and New York where it can form dense thickets that prevent the growth of native plant species. It reputedly prefers sun to part shade but will flower and fruit even in heavy shade. The shrub is propagated by seed widely dispersed by birds. A rise in populations of the ruffed grouse and turkey, due in part to the regrowth of second generation forest, may have much to do with the dispersal of barberry seed, along with the seed's high (up to 90%) germination rate. Vegetative propagation is also an option for this adaptable plant. Any stem that touches the ground can root, as can any bits of root left in the ground after pulling up a plant. Because the shrub leafs out very early in spring and maintains its foliage well after the rest of the forest canopy has dropped its leaves, this may give B. thunbegrii a photosynthetic advantage over native plant species as well. White tailed deer avoid browsing on this plant, which also gives it a competitive advantage over native species. The seeds can remain dormant in the soil for over ten years. Ecological Role: Originally found in the mountains of Japan Berberis thunbergii served as a forest understory sheltering the forest floor from effects of erosion while simultaneously providing cover and a food source for birds and small mammals. Its growth was held in check in its island biogeography by climate and soil limitations that do not, unfortunately, operate as restrictively in the wider North American habitat. 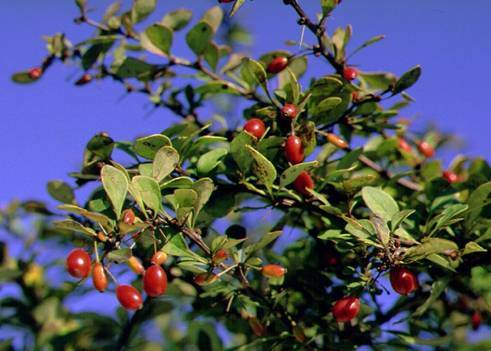 Benefit(s): This shrub serves as a nesting habitat for birds and cover for small mammals. The abundant berries that last from fall through much of winter is a food source, although not a preferred one, for many species of birds. The seeds apparently vary in palatability and are not very nutritious but if they are the only food source available a bird will eat them. A useful act performed by a thicket of Japanese Barberry is that of protecting oak seedlings from deer browsing. Protected by a briar of thorns which the white-tailed deer scorn to eat, an otherwise endangered seedling can get started in life. The plant contains a substance known as Berberine, an isoquinoline alkaloid, that has a wide variety of medicinal uses and is much valued in traditional Chinese medicine and other folk medicine cultures for its antibacterial properties and is used in the treatment of intestinal symptoms and as a bitter tonic. The roots and stems make a deep yellow natural dye. Threat(s): This plant is rapidly displacing native plant species and creating impoverished monoculture areas. Under forest canopies where it doesn't have to compete with similar shrubs that need more light, Berberis thunbergii can form thick stands and displace native plants, reducing variety in wildlife habitat and forage. Studies done in New Jersey have indicated that dense stands of Japanese barberry can change the soil pH and reduce the layer of litter on the forest floor. This change in soil pH may in turn aid the spread of Japanese barberry, as well as prevent the regrowth of native species, even after eradication of the invasive species. It is currently found to be invasively present in 43 protected forest sites in New York State. Connecticut has declared Berberis thunbergii to be "probably one of the most destructive invasive plants in CT." The Japanese barberry can also hybridize with the common barberry (Berberis vulgaris) and become susceptible to black stem rust. For this reason Canada, although having somewhat relaxed their stringent ban on Japanese barberry, (under pressure from nursery lobbying), insists on new cultivars being proven free from black rust fungus, even though it is only a temporary fix because of the hybridization possibilities. Control Level Diagnosis: Highest Priority. The threat of B. thunbergii as an invasive plant should not be underestimated. It is not a creeping vine growing over everything with tropical abundance but it is a highly persistent competitor with an abundance of advantages over native species. At this point in time eradication may be an unattainable goal but an organized and coordinated plan of control should be instituted immediately. The first thing that should be done is to ban the selling of Japanese Barberry from all nurseries, as was done in Canada. Nurseries can instead promote native species such as winterberry (Ilex verticillata), bayberry (Myrica pensylvanica) and inkberry (Ilex glabra) all of which have many of the same attributes of Japanese barberry without the pest's proclivities. Control Method: The best thing is not to plant Japanese barberry at all. Gardeners need to be alerted to the invasive dangers of this plant and nurseries should be offering native species alternatives. For the existent problem, a few options are available, including manual, mechanical and chemical methods. Small isolated plants can be dug up by hand, (wear thick gloves) and it is important to remove every bit of root, including the long taproot, because the plant can regenerate from a piece of root. Because this plant leafs out very early in spring it is easy to identify and not too difficult to dig a smaller plant out of the soil when the ground is moist. For larger plants, (and these shrubs can achieve very large growth, due to their pattern of stem development and vegetative cloning), a hoe or a Weed Wrench is most useful and least intrusive on any surrounding non-target species. Shrubs can be mowed repeatedly, and will eventually give up the fight to survive, although any seed left in the soil can remain viable for years so the area must be continuously monitored. Clipping hedges of barberry plants in late summer, before they set fruit, can help keep down the seed dispersal, although there will always be a few berries left hanging because every arching branch of barberry bears hundreds of flowers. Chemical means such as glyphosate (e.g. Roundup) and Triclopyr have been used with success in eradicating large forest infestations of Japanese barberry. Again, because of the species' early spring leaf out, it is easy to identify and spray carefully before other native vegetation has grown up. Application in late summer during fruiting is also considered effective, but must be applied very selectively as glyphosate will kill anything green with which it comes into contact. There is potential for biological control of Japanese barberry with the tephritid fly, which has been shown in Europe to severely reduce the seed production, but this has not been studied thoroughly in the U.S. Any biological control considered must of course be studied carefully, lest yet another invasive species be introduced into a new habitat. http://www.centerforplantconservation.org/ this site has a great website listing of everything to do with invasive plant species in the US and globally. http://www.invasions.bio.utk.edu/ Institute for Biological Invasions, University of Tennessee, run by Dr. Daniel Simberloff. Includes a comprehensive bibliography of literature and fact sheets on many invasive species. Ehrenfeld, J.D. 1997. Invasion of deciduous forest preserves in the New York metropolitan region by Japanese barberry (Berberis thunbergii) Journal of the Torrey Botanical Society, 124: 210-215. Ehrenfeld, J.G. 1999. Structure and dynamics of populations of Japanese barberry (Berberis thunbergii DC) in deciduous forests of New Jersey. Biological Invasions 1:203-213. Kourtev, P.S., W.Z. Huang and J.G. Ehrenfeld. 1999. Differences in earthworm densities and nitrogen dynamics in soils under exotic and native plant species. Biological Invasions 1:237-245. Silander, J.A. and D.M. Klepeis. 1999. The invasion ecology of Japanese barberry (Berberis thunbergii) in the New England landscape. Biological Invasions 1:189-201.